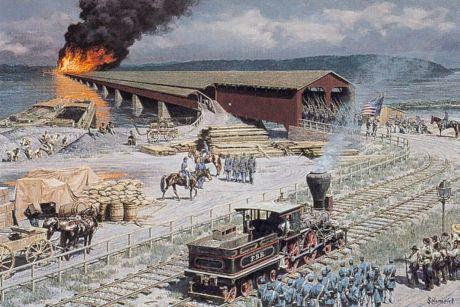 This Bradley Schmehl painting captures the burning of the Columbia-Wrightsville bridge on the afternoon of June 28, 1863. At 5,620 feet long, it was reputed to be the longest wooden covered bridge in the world. Its destruction by Union militia kept the Confederates from crossing to the eastern side of the Susquehanna, which would have given them swift access to Harrisburg and eastern Pennsylvania. It also cut a major line of trade within Pennsylvania until it could be rebuilt.